Music and fashion: the deep connection between these two expressive worlds is firmly entrenched. Yet little attention has been paid to the association of sound and style in the early twentieth century—a period of remarkable and often parallel developments in both high fashion and the arts, including music. This beautifully written book, lavishly illustrated with fashion plates and photographs, explores the relationship between music and fashion, elegantly charting the importance of these arts to the rise of transatlantic modernism. 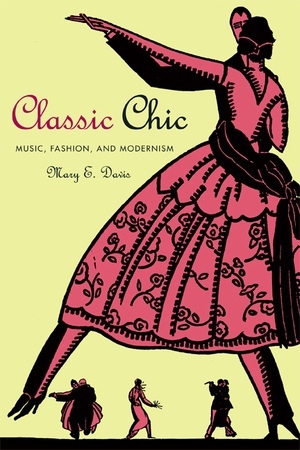 Focusing on the emergence of the movement known as Neoclassicism, Mary E. Davis demonstrates that new aesthetic approaches were related to fashion in a manner that was perfectly attuned to the tastes of jazz-age sophisticates. Looking in particular at three couturiers—Paul Poiret, Germaine Bongard, and Coco Chanel—and three breakthrough fashion magazines—La Gazette du Bon Ton, Vanity Fair, and Vogue—Davis illuminates for the first time the ways in which fashion's imperatives of originality and constant change influenced composers such as Erik Satie, Igor Stravinsky, and Les Six. She also considers the role played by the Ballets Russes, and explores the contributions of artists including costume and set designer Léon Bakst, writer and director Jean Cocteau, Amédée Ozenfant, and Pablo Picasso. The first study to situate music in this rich context, Classic Chic demonstrates the profound importance of the linked endeavors of composition and couture to modernist thought. In addition to its innovative approach to this important moment in history, Davis's focus on the social aspects of the story makes the book a tremendously engaging read.